Technivie (ombitasvir + paritaprevir + ritonavir) is fixed-dose combination drug used in the treatment of chronic hepatitis C (HCV) infection. The three agents that comprise Technivie are also bundled in the two-pill HCV therapy, Viekira Pak. Technivie was approved on July 24, 2015 by the U.S. Food and Drug Administration (FDA) for use in adults 18 years or over with HCV genotype 4 infection (GT4) without cirrhosis. Technivie is the first, all-oral, interferon-free HCV therapy for patients GT4 chronic HCV infection, a population traditionally considered difficult to treat. Technivie was reported to have a cure rate of 100% of previously untreated ("treatment naïve") patients in a Phase IIb trial conducted from August 12, 2012 to November 19, 2013. Two tablets (12.5mg ombitasvir, 75mg paritaprevir, 50mg ritonavir) taken daily with a meal without the need for high fat or caloric intake. 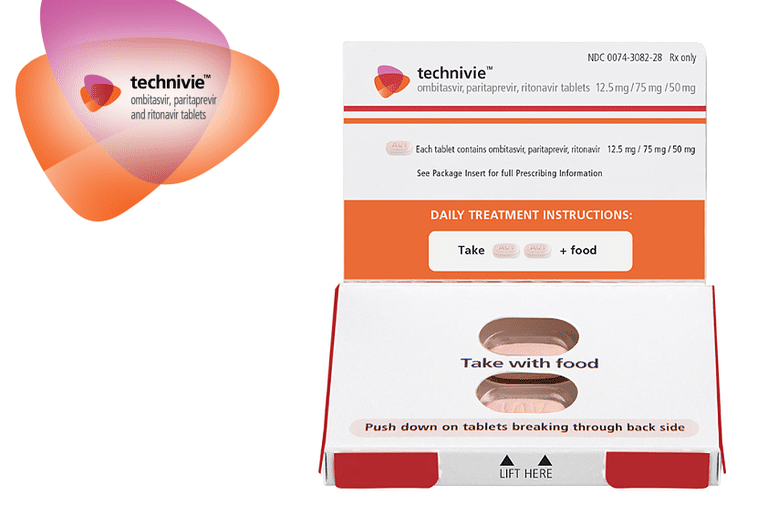 Technivie tablets are pink, oblong and film-coated, with "AV1" embossed on one side. A 12-week course of Technivie can be considered for treatment naïve patient who is unable to tolerate ribavirin. Technivie is not recommended for patients with moderate hepatic impairment (Child-Pugh score B) and is contraindicated in patients with severe hepatic impairment (Child-Pugh score C). Technivie is contraindicated for use in patients with known hypersensitivity to ritonavir (i.e., who have experienced Stevens-Johnson Syndrome or toxic epidermal necrolysis). While Technivie on its own is not contraindicated for use in pregnancy, the combination of Technivie and ribavirin is and should not be used either in pregnant women or men whose female partners are pregnant. In terms of breastfeeding, there were no incidences of abnormal fetal development note in animal studies; specialist consultation is recommended to discuss potential benefits and adverse effects of breastfeeding while on Technivie. U.S. Food and Drug Administration (FDA). "FDA approves Technivie for treatment of chronic hepatitis C genotype 4." Silver Spring, Maryland; press release issued July 24, 2015. Hézode, C.; Asselah, T.; Reddy, R.; et al. "Ombitasvir plus paritaprevir plus ritonavir with or without ribavirin in treatment-naive and treatment-experienced patients with genotype 4 chronic hepatitis C virus infection (PEARL-I): a randomised, open-label trial." Lancet. June 20, 2015; 384(9986):2502-2509.